The founding principle of the United States was that the rule of law would be the great equalizer in American life, the guarantor of a common set of rules for all. But over the past four decades, this principle has been eviscerated. Starting with Watergate, continuing on through the fraud that caused the 2008 financial crisis, and culminating with Obama’s failure to prosecute Bush-era crimes, Glenn Greenwald lays bare the mechanisms that protect America’s elite from accountability, while the politically powerless are imprisoned with greater ease and in greater numbers than in any other country in the world. With Liberty and Justice for Some exposes a new and profoundly un-American justice system that incentivizes elite criminality, protects an oligarchical political culture, and sanctions immunity at the top and unyielding mercilessness for everyone else. GLENN GREENWALD is the author of "The""New York Times" bestsellers "How Would a Patriot Act?" and "A Tragic Legacy." Recently proclaimed one of the "Twenty-Five Most Influential Liberals in U.S. Media" by "Forbes," Greenwald is a former constitutional law and civil rights attorney and a contributing writer at "Salon." He lives in Brazil and New York City. 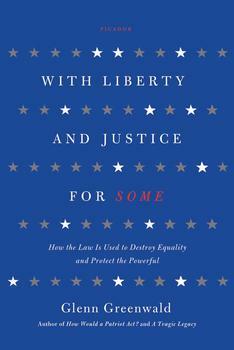 From “the most important voice to have entered the political discourse in years” (Bill Moyers) comes a scathing critique of the two-tiered system of justice that has emerged in America.